That's another residential horror game doomed, then. 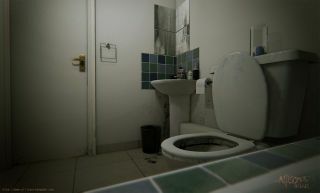 Please enjoy this screenshot of a spooky/filthy toilet in Allison Road, because it might well be the last we see of the PT-inspired horror game. Like its inspiration (or rather, like the full game that would have been made from the Playable Teaser), Allison Road has just been cancelled. There are no explanations given yet, but this tweet from the official Allison Road account is unequivocal. "Hi all. Sadly Allison Road had to be cancelled. Statement to come in the next few days. Thx for all your support and very sad it came 2 this"
You might remember that Allison Road once had a Kickstarter, which was cancelled after Worms developer Team17 offered to publish the game instead. We can only speculate why development of Allison Road has now stopped, but it's obviously as the result of the PT Curse, which dooms every game that's even loosely related to Konami's cyclical residential horror.